We see “Green” everywhere we go. Whether you realise it or not businesses of all sorts and sizes have adopted and still are adopting the energy efficient way of life. Construction companies are focusing more and more on having a positive impact on the environment and less and less on creating and building traditional houses, office blocks and shopping centres. On a smaller scale, restaurants and coffee shops are using organic produce on their menus. Yes, the “Green” age is here and by the looks of things, it is here to stay. So what has your business been doing to work towards that desired “Carbon Zero”? 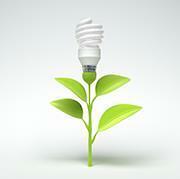 Being an energy efficient brand might sound simple however it requires ongoing dedication from within the business. How Should I Encourage Employees? The easiest way to introduce a green lifestyle into the workplace is perhaps through introducing organic and sustainably produced foods. Coffees, teas, sugar, milk. This is a great place to start and an even better way of getting employees excited about being sustainable. Using sustainable suppliers is another way of slowly becoming “green”. There are plenty sustainable paper suppliers, printing companies and even cleaning companies in South Africa. So just look around and you’ll be surprised what you find. Smartphones are everywhere these days and although Green Apps, might not be as well known in South Africa, they do exist. Encouraging staff to support Green Apps, is just another step in the right direction for not only your carbon free footprint, but for your Green business image. What Should I Do as a Business Entity? There is of course a list as long as The Great Wall of China, containing the environmentally friendly or “green” pointers to look out for. As a business, it can be challenging to enforce a green lifestyle into the workplace.